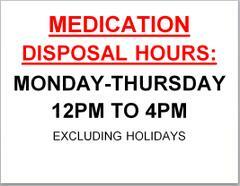 The Lakeport Police Department opened a safe medication disposal collection site at the department in January. So far, we have seen people from all around Lake County coming into our office to safely dispose of over 72 pounds of unused or unneeded medication. The safe medication disposal safe was donated to out agency by the Rite Aid Foundation KidCents Project which is committed to supporting the safety and well-being of children in our communities. To continue our efforts with this mission, this April we will join the DEA National Prescription Take Back Day with a local event. Several thousand police agencies are expected to hold events throughout the United States on the same day. These events typically take in around 900,000 pounds of prescription drugs. We will post more details in March when our event is confirmed.